The Molokai culture and lifestyle are of aloha and sharing. In that neighborly spirit, in addition to our products listed here, we provide links to some island artists and crafters whose products we think you will enjoy. If you are downtown in Kaunakakai, you must visit Kalele's book store and meet Aunty Teri. Another must go to store is Something for Everyone located above American Savings. Our famous Kanemitsu bakery another must do's with their hot bread! Our Kamoi's icecream is another spot that will make you want more! Amazing flavors and fun for all! 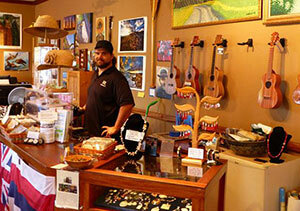 The local store is a small shop accross from the front desk in the lobby of Hotel Molokai. Don't let the small size fool you, this store has everything you forgot to bring and more trinkets and local crafts than you can imagine. Stop in and check them out during your visit, they are sure to have something to strike your fancy. 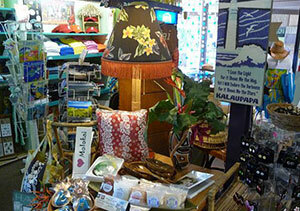 Beach Break has a delightful mix of gift items created on Molokai and brought in from afar. Ukuleles, lauhala hats, jewelry, books and more. Owner/Photographer Zach Socher has a great selection of Molokai photos to chose from if you want to take home a lasting memory. Beach Break also offers surfboard rentals. Located at the intersection of Kam V Hwy and Hwy 470 (Kalae Hwy), you will also find a complete selection of their coffee here. Molokai Art From The Heart features the work of more than 140 Molokai artists. 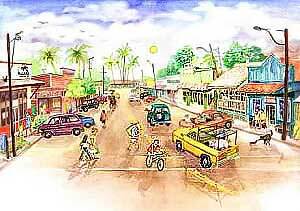 Here you will find paintings, photographs, carved and turned wood, Hawaiian quilts and fabric art. Also, seed, shell, lauhala and silver jewelry, plus every other type of island art work. 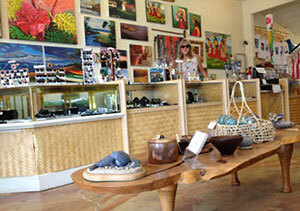 Located in downtown Kaunakakai, Molokai Art From The Heart is well worth a visit. 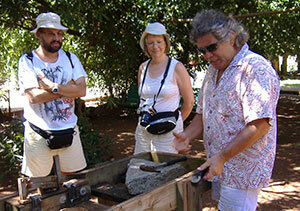 Visit a working macadamia nut farm. Crack a few of those delicious nuts yourself and talk story with Tuddie and Kammy, the owners. You can learn everything you ever wanted to know about mac nuts and sample a few roasted or raw. Learn about Hawaiian culture and this island from folks who live Aloha. 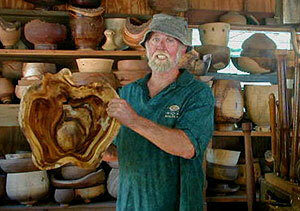 Jack Ewing specializes in woodturning Koa bowls, Bark edged Koa bowls, Curly Koa bowls, Norfolk pines bowls, and Hawaiian Kou, Milo and Kamani bowls and Hawaiian calabashes. He turns the Norfolk pines bowls and lampshades very thin which allows them to be translucent creating spectacular art pieces, something like a wooden Tiffany. You can find Jack's work at several of the local gift shops or contact him directly through his website. One of our favorite local artists, Linda's fun and useable creations depict memories and scenes of Molokai in passionate tropical colors. Vibrant florals, landscapes and hula dancers capture the quiet essence of beautiful Molokai. Linda sells her work in the local gift shops and you can find her in town most Saturdays at the open market. You can also order directly from her website.